The November 2013 closure of the Logie Baird pub on James Street, Helensburgh, prompted Malcolm Baird to reflect on his father's connections with alcoholic drink. JOHN LOGIE BAIRD was the son of a Scottish minister and he was raised in the late Victorian era. His sister Annie, who lived until 1971, told me that in those days there was no alcohol in the family home except for a small unopened bottle of brandy that was kept for medical emergencies. Between 1906 and 1913 my father was a student at the Royal Technical College in Glasgow. My father neither drank nor smoked as a young man, since he had suffered a near-fatal illness when he was a baby and he had what was known as a "weak constitution". In any case, drink played a smaller part in the Scottish student culture than it does now; there were no bars in the college buildings. In 1926, soon after the first breakthrough with television, a public company called Television Limited was formed with my father as managing director. The company office was at Motograph House in St.Martin's Lane in the theatrical district of London, just round the corner from the famous Ivy Restaurant which was — and still is — a favourite in theatrical circles. It was here that my father and Captain Oliver Hutchinson, the manager of the company, first tasted the delights of high living. My father takes up the story in his memoirs which were published in 2004 as "Television and Me". Hutchey and I lunched together; it was the high spot of the day. Commencing with cocktails we went through hors d'oeuvres, rich pea soup, fritto misto, curried chicken and Bombe Gladys Cooper, washed down with copious draughts of Chateau Y'quem, followed by coffee and petits-fours washed down with Bisque d'Bouche Brandy. Gorged and bloated and belching, we tottered over to Motograph House and awaited afternoon tea. Those were the days! But they were too good to last. The cold weather arrived and I caught my usual winter chill, but this time it was complicated by liver and other disorders. I did not throw it off properly. Alarming symptoms developed, my nose swelled to twice its normal size and became a vivid crimson, and I suffered from acute catarrh. I consulted a specialist and was warned to avoid in future all wine and rich food. The Ivy days were over. By the time I remember my father, in the 1940s, he was still on an austere diet which consisted mainly of dry rusks, steamed fish, and fresh fruit whenever it could be obtained. His drink of choice was soda (carbonated) water from heavy glass bottles known as 'soda water siphons', which could be refilled at the local chemist for a shilling or so. In spite of my father's rather limited connections with alcohol, there are two public houses which carry his name. In chronological order of opening, these are: The John Baird in Muswell Hill, North London, and the John Logie Baird, a Wetherspoon's franchise, in Hastings. 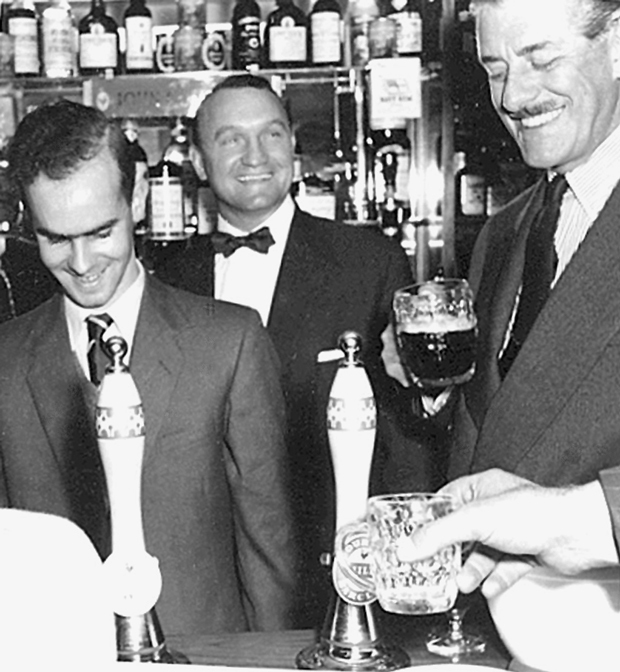 The John Baird was opened by the Courage group in September 1959 and I was invited to the opening ceremony to 'pull the first pint' of draft beer. I did not have far to travel as I was working in Cambridge as a research student at the time. The picture above shows me rather inexpertly pulling a pint; behind me is the licensee, the retired boxer Wally Pack. On the right is the debonair Leslie Mitchell who had been the BBC's first full-time male television announcer in 1936. In 2007 the Barracuda group opened the Logie Baird pub/restaurant in Helensburgh in the former La Scala cinema dating back to 1913. The old building was completely renovated at a cost of ₤800,000. However the Logie Baird was closed in November 2013 because of lack of business. At the time of writing, the future of the hundred year old building is uncertain.